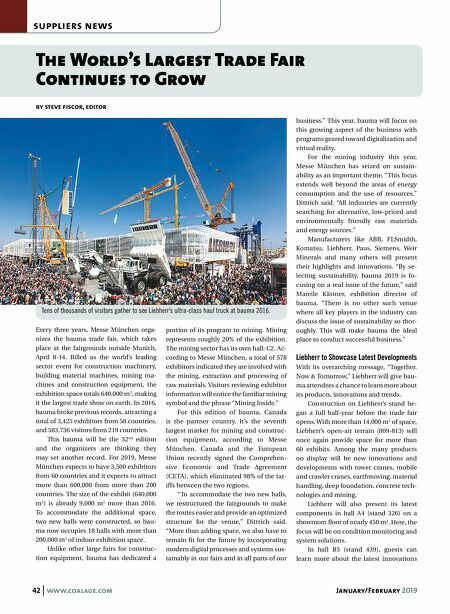 42 www.coalage.com January/February 2019 suppliers news The World's Largest Trade Fair Continues to Grow by steve fiscor, editor Every three years, Messe München orga- nizes the bauma trade fair, which takes place at the fairgrounds outside Munich, April 8-14. Billed as the world's leading sector event for construction machinery, building material machines, mining ma- chines and construction equipment, the exhibition space totals 640,000 m 2 , making it the largest trade show on earth. In 2016, bauma broke previous records, attracting a total of 3,425 exhibitors from 58 countries, and 583,736 visitors from 219 countries. This bauma will be the 32 nd edition and the organizers are thinking they may set another record. For 2019, Messe München expects to have 3,500 exhibitors from 60 countries and it expects to attract more than 600,000 from more than 200 countries. The size of the exhibit (640,000 m 2 ) is already 9,000 m 2 more than 2016. To accommodate the additional space, two new halls were constructed, so bau- ma now occupies 18 halls with more than 200,000 m 2 of indoor exhibition space. Unlike other large fairs for construc- tion equipment, bauma has dedicated a portion of its program to mining. Mining represents roughly 20% of the exhibition. The mining sector has its own hall: C2. Ac- cording to Messe München, a total of 578 exhibitors indicated they are involved with the mining, extraction and processing of raw materials. Visitors reviewing exhibitor information will notice the familiar mining symbol and the phrase "Mining Inside." For this edition of bauma, Canada is the partner country. It's the seventh largest market for mining and construc- tion equipment, according to Messe München. Canada and the European Union recently signed the Comprehen- sive Economic and Trade Agreement (CETA), which eliminated 98% of the tar- iffs between the two regions. 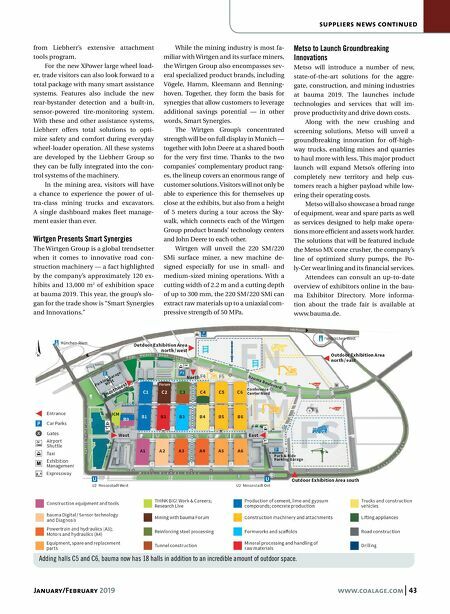 "To accommodate the two new halls, we restructured the fairgrounds to make the routes easier and provide an optimized structure for the venue," Dittrich said. "More than adding space, we also have to remain fit for the future by incorporating modern digital processes and systems sus- tainably in our fairs and in all parts of our business." This year, bauma will focus on this growing aspect of the business with programs geared toward digitalization and virtual reality. For the mining industry this year, Messe München has seized on sustain- ability as an important theme. "This focus extends well beyond the areas of energy consumption and the use of resources," Dittrich said. "All industries are currently searching for alternative, low-priced and environmentally friendly raw materials and energy sources." Manufacturers like ABB, FLSmidth, Komatsu, Liebherr, Paus, Siemens, Weir Minerals and many others will present their highlights and innovations. "By se- lecting sustainability, bauma 2019 is fo- cusing on a real issue of the future," said Mareile Kästner, exhibition director of bauma. "There is no other such venue where all key players in the industry can discuss the issue of sustainability so thor- oughly. This will make bauma the ideal place to conduct successful business." Liebherr to Showcase Latest Developments With its overarching message, "Together. Now & Tomorrow," Liebherr will give bau- ma attendees a chance to learn more about its products, innovations and trends. Construction on Liebherr's stand be- gan a full half-year before the trade fair opens. With more than 14,000 m 2 of space, Liebherr's open-air terrain (809-813) will once again provide space for more than 60 exhibits. Among the many products on display will be new innovations and developments with tower cranes, mobile and crawler cranes, earthmoving, material handling, deep foundation, concrete tech- nologies and mining. Liebherr will also present its latest components in hall A4 (stand 326) on a showroom floor of nearly 450 m 2 . Here, the focus will be on condition monitoring and system solutions. In hall B5 (stand 439), guests can learn more about the latest innovations Tens of thousands of visitors gather to see Liebherr's ultra-class haul truck at bauma 2016.